Please stop arguing about Duck. -The cab is slightly too long. Another problem is that Duck's whistle looks inaccurate to his TV series model. That's pretty much it. As for Paxton, it's possible that he MAY get released by the end of the year. That's if he doesn't get delayed of course. We managed to get Celebration Thomas by the end of 2015, though his prototype was already shown when first announced. Bachmann Oliver and Mavis are pretty much the same size. Now that I think about it, I don't think it's that Oliver's undersized. If anything, Duck could be oversized. Considering how long he is. He's bigger than Diesel. Are they sort of the same size in length, height or both? In just one month, Oliver already outsold Duck! That's phenomenal! Head Lamp more accurate to the TV Series than on HO Thomas, Percy and James, and the tail lamp is an added bonus! Taller than Bachmann Toad, as he should be and buffer beam, lining up with most of the rolling stock. 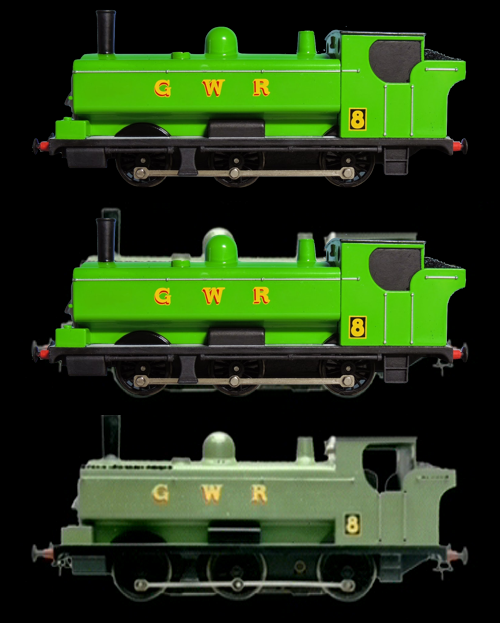 kudos for you Bachmann for overcoming the CGI render size problem on Oliver. Nitpick: Lack of front tank handrail, but can be fixed with a bit of fuse wire. Final Rating: 11/10! Well worth the two year and one month wait! Well done Bachmann.